The Conductive Blouse showcases smart textiles properties, conductive materials and a textiles integrated electrical circuit. 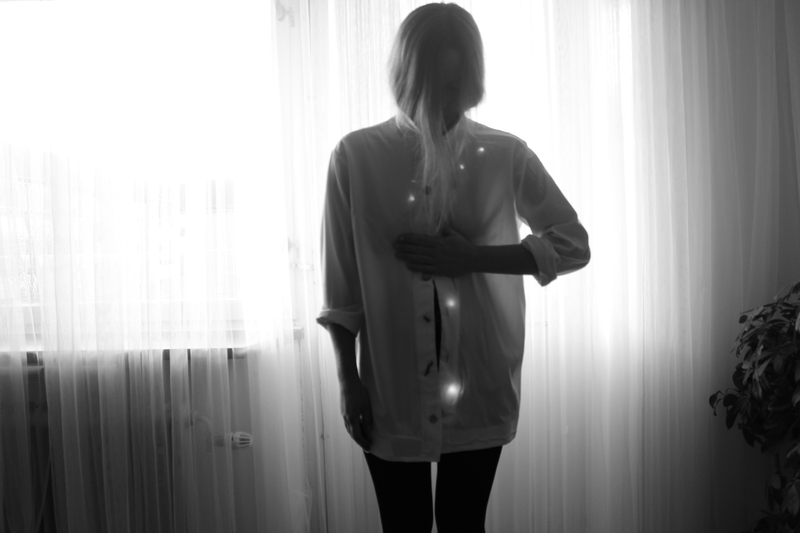 The Conductive Blouse is a blouse with a conductive circuit made out of conductive yarns and light emitting diodes. The original buttons are replaced with a metal button, a piece of wood, conductive wool, a regular textile button, a conductive woven, a plastic button and a copper button. The buttonholes are hand stitched with conductive yarn. Once the shirt is buttoned up, it becomes clear which materials are conductive because then a light will go on. The schematic of the conductive blouse is taught during a two day workshop to fashion and graphic professionals at Artediez in Madrid, Spain. The garment invites for intuitive and tactile interaction and is suitable for playful science & material education. The project’s vision received an honorable mention for woman in today’s science and society by the American Ambassador during the Mini Maker Fair in Stockholm at the Tekniska Museet in Stockholm, Sweden. The costumes are presented at the AHHAA Science Center in Tartu, Estonia for European Researcher’s Night 2014 and during HX Helsingborg at Creative Lab in Helsingborg, Sweden. We would like to thank Eva Jonsson from http://instagram.com/stilsamt for her wonderful pictures!